Very pleasant nose: exotic fruits, mint ... It warms on malt. And there is also some peat. On the palate, malt and "green malt" (the mental image, not the biological definition). Fruity finish of the most beautiful effect. An irish eyeing the side of Littlemill, then. Rather mute. Need time to open. A bit of exoticism: green and ripe bananas, and some small red berries (wild strawberries - raspberries - I do not know) and blackcurrant buds. I feel that it is still necessary to get this nose because it is definitely not powerful. With more time, a very slight smoke and fruits are more intense. Becomes interesting. In continuity with these red fruits: blackcurrant, strawberries. A little papaya. A lot of peps. Long, more sweet. A very slight smoke dries as in some Yoichi. 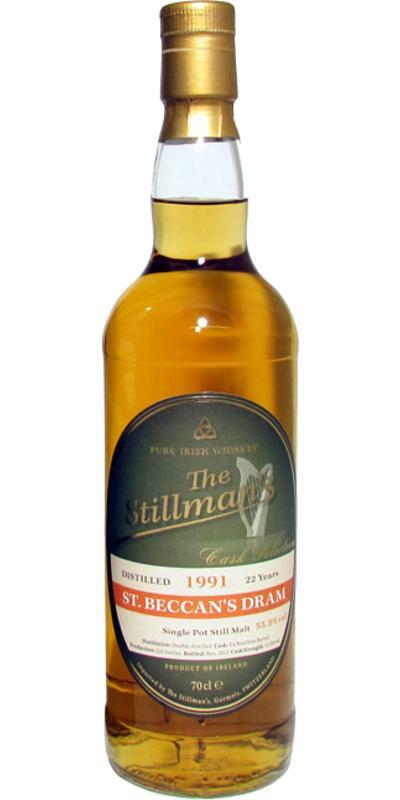 St. Beccan’s Dram 22 yo 1991/2013 (55.3%, The Stillman’s, single pot still, bourbon wood, 210 bottles) The Stillman’s is an excellent little Swiss bottler. Let’s see if we can guess what this is… Colour: straw. Nose: reeks of Redbreast if you ask me, but it’s a little less rounded and polished than Midleton’s ‘usual’ output. Actually, there are more fresh fruits, and less fatty/oily parts. Tangerines, oranges, Williams pears… Some parts remind me of the Whisky Fair’s 1991 as well. These Irishes can lose you, I tell you! Mouth: absolutely terrific! Mangos, Juicyfruits, cassata ice cream, passion fruits, raspberries, mint, chives, aniseed, liquorice… This is simply superb! What it exactly is, I don’t know, but it’s a brilliant Irish. One of the best I’ve ever tried, in truth. Finish: long, fresh, superbly ‘nervous’ and citrusy, ultra-clean, sauvignony (!) Comments: I find this one absolutely exceptional. Very well selected, Stillman! I even forgot to try it with water… SGP:761 - 90 points. Reminds me pf Auchentoshan because of the marsmellow notes. This is very good! The bottler says it's a Cooley.